I didn’t enjoy Kona much this year – I wasn’t there. I hate to admit it, but I followed the event with jealousy; I’ve only been twice, but after a few years trying to qualify it has become part of my season. Each blog I read or podcast I listened to made me more determined to return. I wanted to be there. I have unfinished business on the island – I’ve yet to race my best. My first year was good, a surprising result, but the second was marred by injury and performance fell short of expectations. I haven’t managed perfect race execution in Kona. Checking results on Sunday morning I was pleased to see Nick Baldwin had claimed second in his age group with a time of 9:18:15. I’d met Nick in Hawaii the previous year when he had a solid debut. He wanted more and dedicated himself to improving, his goal was the age group podium. Following Nick’s blog there was no doubt about the commitment or the potential. His hard work paid off and he executed a perfectly paced race on Saturday. He also logged it and was generous enough to send me his data to examine. Nick doesn’t have a swim background. In 2010 he was a similar pace to me, but consistent training this year saw him out of the water in an hour; a good swim by Kona standards. While there’s no GPS or other data to look at, from Nick’s description it was a matter of controlled effort. If one factor defines the day it was control – Nick was always working comfortably within his ability. A text book Ironman bike. No spiking of effort, power comfortably within the cap and increasing over the ride. 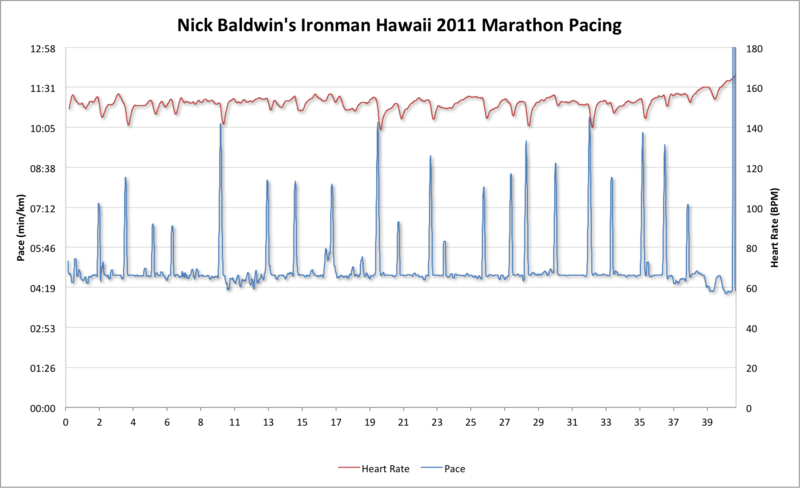 Nick’s tactics were similar to mine – hold back a little until Hawi, then on return to the Queen K lift the pace. In my experience many athletes push too hard to the turn around and struggle to sustain the effort back to town. Paced correctly you spend the second half of the race moving through the field. Not only do you gain places, but it’s a huge boost to morale. 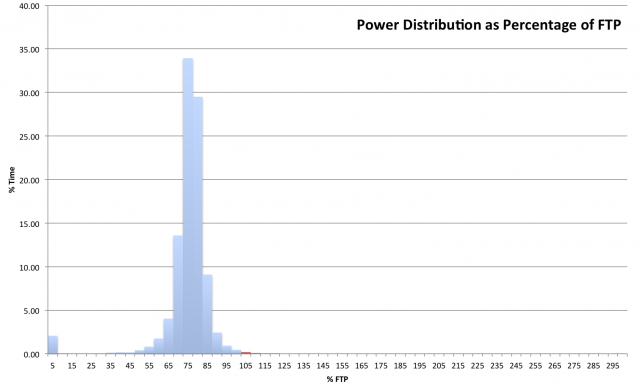 Nick spent virtually no time above FTP, he rode almost the entire race at 70-80% of it. 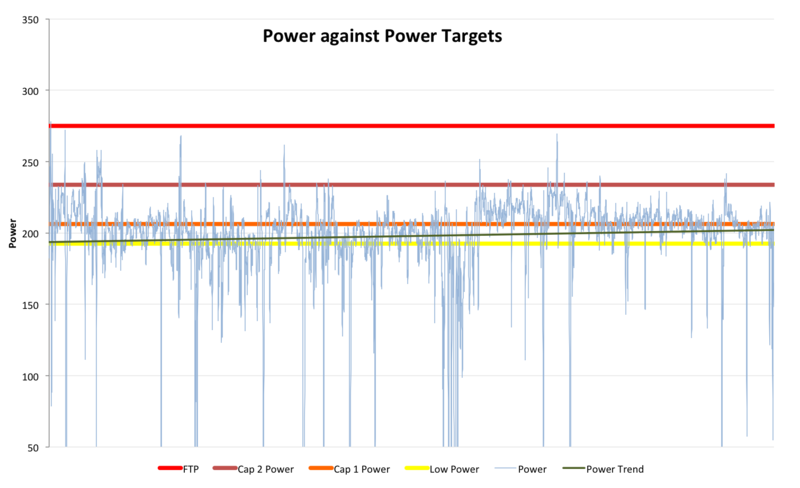 The most common mistakes I see in Ironman power files are riding too hard initially (see my recent Challenge Henley data for that) and spikes in power, particularly those crossing FTP. 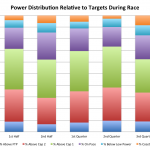 The former leads to an inevitable decline in performance as the race wears on, the latter can see a notable fade towards the end of the ride. Both drain the legs and if they don’t cost time on the bike they will on the run. The final chart shows Nick quickly got his heart rate under control out of transition – the result of good pacing. The early section of the bike on Kuakini Highway is crowded, it’s tough to keep in control up this tough incline. 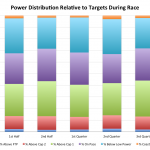 There is a slight upward trend in HR and power over the 112 miles, nothing severe, but it shows how controlled that early part of the race was. Nick never worked beyond his limits and as planned was able to raise the effort for the retune leg. I already mentioned jealousy – I am jealous of such a text book ride. In 2010 I passed Nick about 10 miles into the marathon, it lasted for a mile before he came back. Shortly after Palani I started to fade on route to my detonation in the Energy Lab. Nick remained consistent and finished strongly, but he knew he needed more. One of his focusses for the season was improving his run. This year he stared with a goal of running 3:15, achieving 3:18 shows how carefully he paced himself. The only change to Nick’s steady pace is when he walks aid stations, otherwise the consistency is impressive. 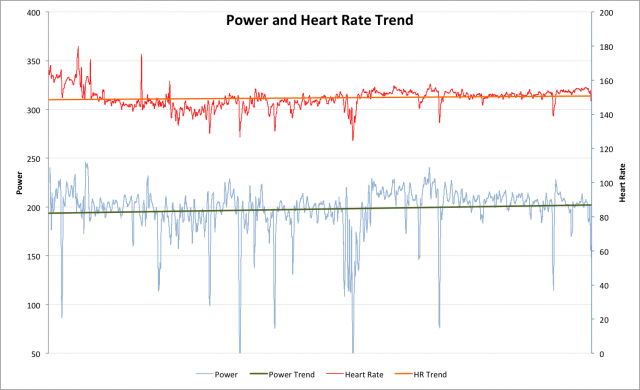 Heart rate settles and holds steady from the start only rising as he lifts the effort towards the end of the race. 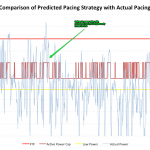 Pace doesn’t change vastly, but at that point it’s often about being able to hold pace. Clearly Nick did – perfect execution that took him from third off the bike into second overall. An impressive result from an impressively controlled race. To hold yourself back early on the bike takes discipline, but pays off. Nick spent a lot of time practicing riding above race pace, by race day he was confident he could easily handle the effort. He’s also been working to improve run performance with lots of consistent work to develop his marathon pace. It’s a step up, but running remains the area he has a lot to gain in. There’s ten minutes to the age group winner, something to target for next year.